By Mark Alfrey. For serious life casting artists knowledge of sculpting the human head is a must to know how to sculpt open eyes, repair ears and make artistic and realistic changes to your casting. 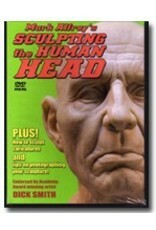 Learn step by step from sculptor Mark Alfrey how to create a human head in clay from armature to the final detailing. In addition, you will learn how to take a great picture of your work for your portfolio. 60 minutes.